"A riveting, well-documented account of survival that’s harrowing, inspiring and unforgettable." In 1945, Joe Rubinstein walked out of a Nazi concentration camp. For over 70 years, his story would remain hidden from the world. Shortly before dawn on a frigid morning in Radom, Poland, twenty-one year-old Icek “Joe” Rubinsztejn answered a knock at the door of the cottage he shared with his widowed mother and siblings in the Radom Ghetto. Two German soldiers told him they were taking him. “But I haven’t done anything wrong. Why? Why?” They ignored his questions. He said he had to tell his mother goodbye. He said he had to change his clothes. They told him he had everything he needed. He looked down at his undershirt, shorts and bare feet, and thought, “Everything I need”? They marched him outside and forced him onto a crowded, open-air truck. With no protection from the cold, he huddled with a group of strangers. By the next morning, several around him would be dead from exposure. From there, things got worse for young Joe, much worse. Joe arrived at Auschwitz-Birkenau April 30, 1942. It would be 70 years before he told anyone how he survived. Joe's remarkable story is a powerful account of perseverance and resilience as he endured over two years at Auschwitz before being sent to several of the other notorious Nazi concentration camps. His is a surprising story of love and the triumph of the human spirit. While the Nazis took everything else, they were unable to take Joe’s love of life, his affection for others, and his unassailable joy. His is a story of unconquerable courage and discovering light in the darkest of places. From the ashes of his life, Joe would find a way rise above the atrocities that he endured. Barefooted when he was taken by the Nazis, he would become one of New York's' leading shoe designers. Joe’s story is life-changing for all those who hear it. It has readers and audiences laughing, crying and cheering. 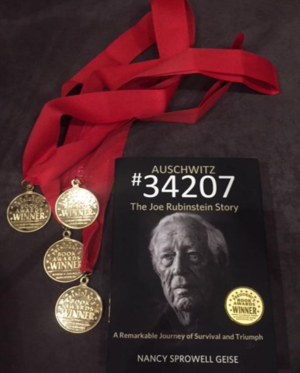 Auschwitz 34207 “The Joe Rubinstein Story” is for all of us—a testament to the power of faith, perseverance and hope. "A beautifully written, thoroughly researched and compelling story. I'm hooked." "Stretches of writing that must represent some of the best writing ever done on this subject."